This Ghost Train is without question the best in the UK! 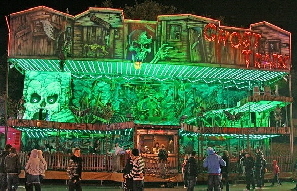 It’s an awesome three floors of bone-chilling thrills unrivaled by any other mobile dark ride. This stunning and unique Haunted Mine themed Ghost Train is the creation of highly experienced and World renowned “Dark Ride” designer, builder and operator, Gilbert Chadwick Jr. Scary enough to give you goose bumps but not so scary that it can’t still be enjoyed by all members of the family - the balance here is just right for everyone! As you are transported through the Haunted Mine you will experience all manor of ghouls , goblins and ghosts as well as a torture chamber and twisted tunnel to hell. Is there enough space? The Ghost Train is 63 feet wide and approximately 24 feet deep (other smaller Ghost Trains are available if space is limited). As well as being large enough to accommodate the Ghost Train, the allocated space should be relatively level and hard standing. 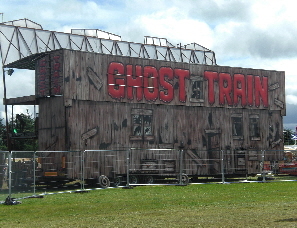 Site access - the Ghost Train is mounted on a large articulated lorry. Therefor you will need to consider access roads, gates and space to maneuver around the site itself. 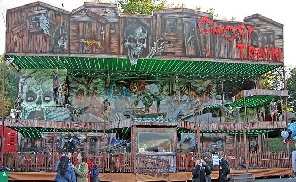 The Ghost Train is available to attend public events or for private hire at events around the UK. For a no obligation tailored quote for your event, please contact us.